“While there are many things that a pastor does in ministry, nothing is more important than his devotion to teach and preach the Bible, the very Word of God. For that reason, a pastor needs to do everything he can to prepare himself to be the most skillful, knowledgeable, and prepared servant of the Word that he possibly can be before the Lord. 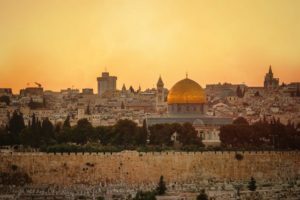 One of the best means of training the pastor to handle the Word effectively and passionately outside of his seminary or Bible school studies is a trip to Israel – the very land of the Bible. In fact, I would go so far as to say that a pastor has not fully completed his seminary or Bible school training until he has been to the land of Israel. That is especially true these days with the ease and security and relatively low cost of travel to Israel. I served as a pastor for 25 years, earning two degrees in theology and Bible exposition. I had knowledge of Israel from my studies in the Scriptures and Bible atlases. Still, for me there was nothing to compare with actually standing on site in Israel and reading the text of the Bible within its geographic context. The geography of Israel plays significantly into much of the text of the Scripture, and unlocking the proper interpretation of the Bible will undoubtedly rest to a large degree on the interpreter’s first-hand knowledge of the land itself. I encourage every pastor to get to Israel by all possible means. It will deepen your understanding of the text of Scripture. It will ignite your passion to faithfully teach and preach the Word. It will change those that listen to you; and it will forever imprint Israel upon your mind and your heart. « Evangelical Free Church Deepened their Faith as they followed in the Footsteps of Jesus through the Holy Land!